Mission Creativity: Fort Point hurray! Saturday was my first day off in two weeks. Of course I slept in! Then Jenna & I went shopping and picked out new glasses for me. Jenna picked out glasses that Chicken Little wears for herself. Luckily she didn't have her prescription with her! I can't wait for mine to arrive so I can share. Then I decided to play photo tourist. I love that I can just go on a whim to San Francisco whenever. 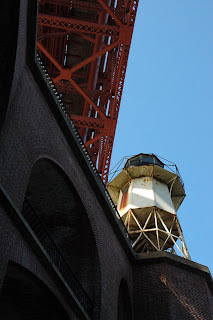 Fort Point National Historic Site has been on my list to see since Spring 2004! I was thrilled to finally go. 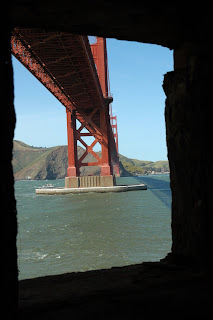 I got some less cliche photos of the Golden Gate Bridge and the surrounding area of Fort Point. It was a beautiful day but really windy! I was most happy that I finally shot black and white film. I'm looking forward to developing it tomorrow night at lab. I'll upload more to my flickr later. 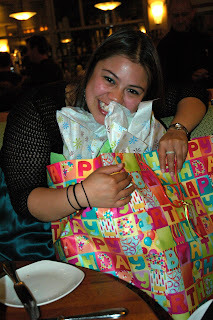 Then I went to the Beach Chalet to celebrate Jessica's 24th Birthday. Here she is opening a huge present from Lilly & Katie. We went bowling at Serra Bowl. 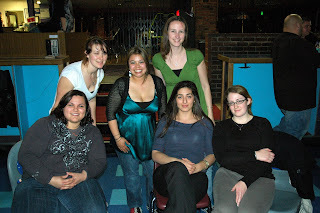 From left to right: Maria, Peggy, Jessica, me, Lilly, and Katie. We had a fun time. 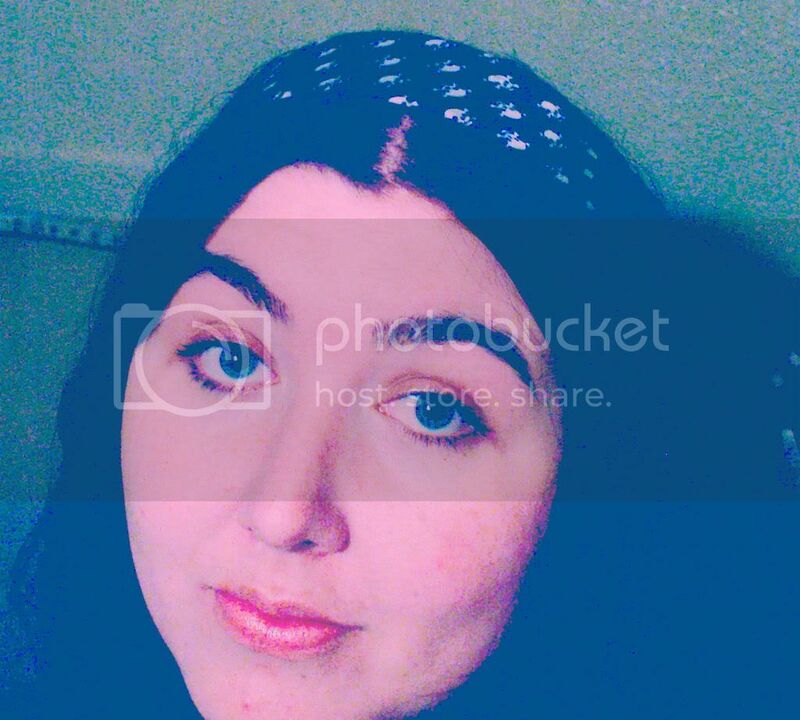 My photo retouching job has come to an end so I will have a tad more time for my paper crafting and social life. Still incredibly busy with my associate producer job and I am loving it! That's all for now! I really look forward to reading all of your wonderful comments. They brighten my day! Yeah for a day off. I really like the photo of the window. ooh...your job sounds so fun...=) Love the pictures!! Happy you finally got a day to sleep in, too! 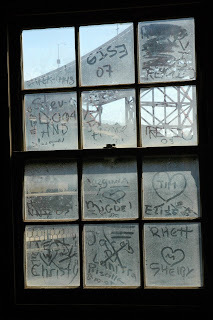 ohhh I love that foggy looking window with the writing!! Glad you had a good day off! Those are wonderful pics of the bridge! Yay for more sleep!